Art & Inspiration from professional artist and instructor Pat Fiorello. 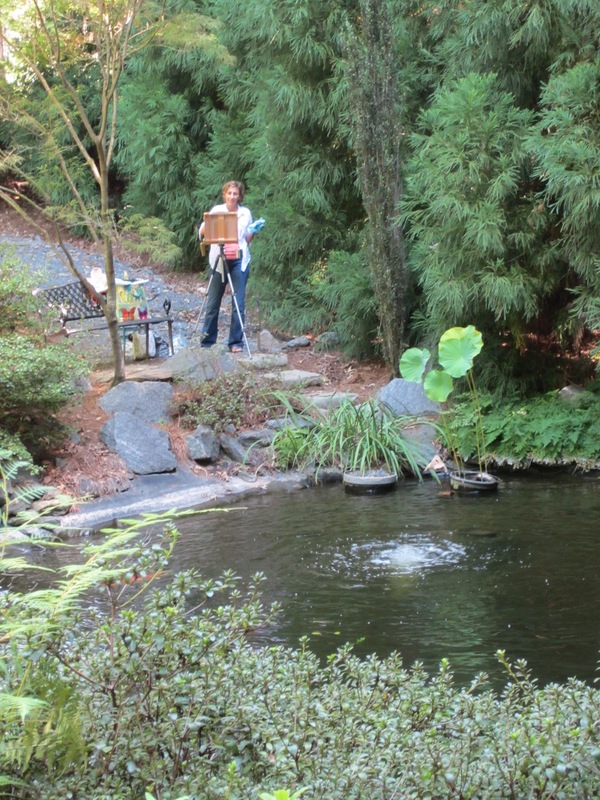 Pat is known for her romantic landscape, garden and floral paintings in oil and watercolor. 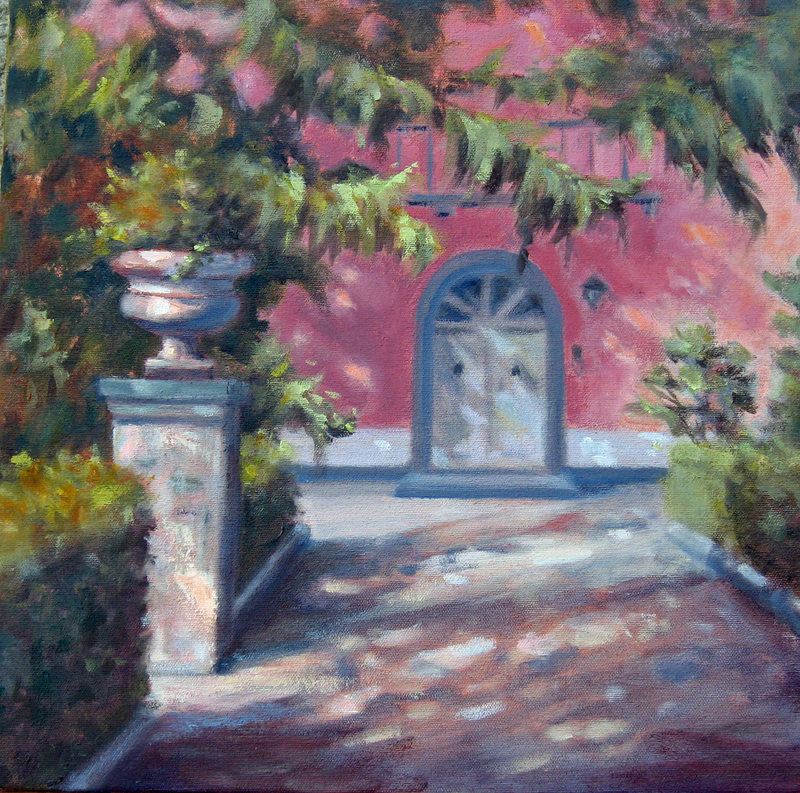 Her paintings often depict beautiful places like Italy and France. 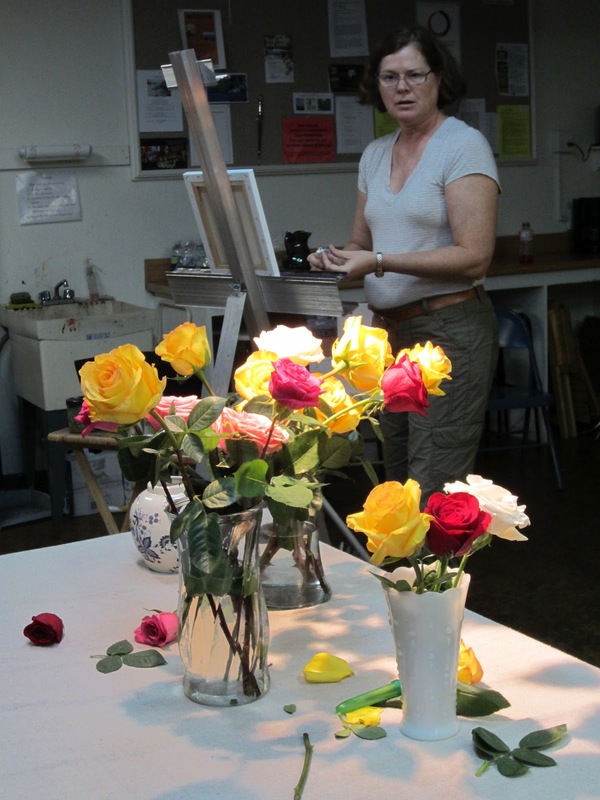 Pat teaches painting workshops in the U.S., Caribbean and Europe. She is passionate about inspiring others to include art in their life. Whether creating it or simply appreciating and enjoying it, there are so many ways that art elevates life! These are actually some of the same flowers from the painting shown in my last blogpost rearranged the next day in another vase. This was a quick study where I was focused on trying to capture the simple pattern of light and shadow on this small canvas without a lot of detail. Spent the weekend, teaching a 2 day workshop at the Atlanta Artists Center on Painting Flowers in Oil Alla Prima.The painting above wasmy demonstration painting from Saturday morning. I was satisfied with the softness, but wish I hadn't let the white rose drift to center stage. Here was the arrangement I set up. Here was the start of the block in. Here are some of my students doing rose studies on day 1. What will you be doing 1 year from today? I'm a firm believer that we need to create things to look forward to in life. I find that even though it my be a plan for something in the future, it often generates enthusiasm and energy in the here and now. ( If you're as old as I am you might remember Heinz ketchup tapped into that feeling with it's "Anticipation" advertising campaign). So I have an invitation for you. 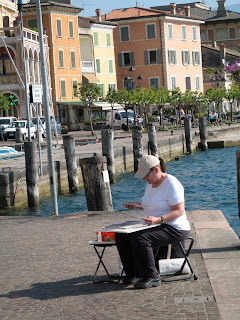 Imagine one year from today, you are on the shores of beautiful Lake Garda in northern Italy, painting the enchanting landscape, enjoying some amazing Italian food in the company of a small group of other fun loving artists. Well you can be there! I'm excited to announce that my next International painting workshop starts exactly one year from today. It runs from September 21-28, 2013 and we'll be going to Northern Italy. We'll spend a night in Milan then the rest of the week in Lake Garda with field trips to Verona and several other nearby towns. So you have time to clear your calendar, get your passport, plan, pack, save up and do whatever you need to to make it happen and have an amazing experience to look forward to and enjoy. Whether you're an experienced painter, or are just finally ready to learn to paint, this will be a week of growth, fun and beauty- a creative and cultural immersion in a very special place. View from the dock in Gargnano- a small town in walking distance of where we stay. The front of San Tomaso, our home for the week. Up on the hill with a majestic view of the lake. For more information see Lake Garda details. The price of $2,295 which includes lodging in Milan and Lake Garda, all breakfasts and dinners, local transportation within Italy, and the workshop is valid through 12/31/12 and space is limited so register now. A deposit of $500 is all that's needed to reserve your spot. If you are ready to register you can simply go to: I'm on my way to Italy! If you need a little more enticing, listen here to my friend Shelly Steele of MosaicVoice who joined me on the last trip there. Please contact me to be on the "interested" list or if you have any questions. Thank you. I hope you will join me on this exciting artistic adventure! I did the painting above as a demonstration in my landscape painting class this week. Part of the purpose of the demonstration was to show students techniques for painting a landscape and the sequencing of what comes first etc.. But also I wanted to show how to go beyond sticking to painting from a single photo and how to plan and design a painting using multiple photo's. I liked this one not only because of the memories associated with it from one of my early trips to Tuscany, but also because I liked the chunk of light buildings, clustered in an interesting shape surrounded by the dark trees. However the foreground left a bit to be desired. so I went to other photo's of that same area to see what other elements I could include. Then I thought it might be nice to include some vineyards for directional purposes and to be more attractive than the dirt in the original reference photo foreground . 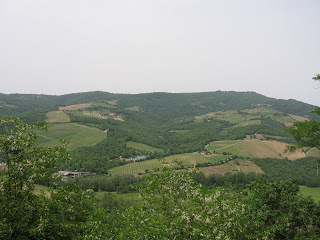 The vineyards are of course authentic to Tuscany so it would be plausible that there were some vineyards in this scene. Finally I put the elements together in a very simple value sketch with 3 values that reminded me of my light areas- sky and architecture, my dark areas; the trees, and then everything else was pretty much in between. I used Sepia and did it in watercolor. I find if I use a pencil I want to get too detailed, so I prefer to use a brush or big markers for my value sketches. In fact I think I'll start calling them value plans, because sketch conjures up a lot more drawing and detail than is needed at this point. Note I also sized my value plan to be proportionate to the final painting. I knew I was going to do the demo on a 12 x 16 block of watercolor paper, so my plan was 1/2 that size 6 x 8. With my value plan and photo's available, I completed the demo of Tuscany Memories above. 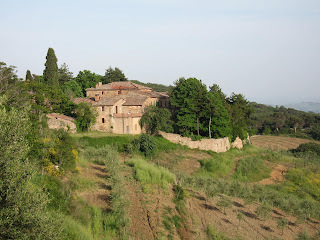 It was a good warm up for me too as I'll be teaching a workshop in Tuscany in a few weeks. 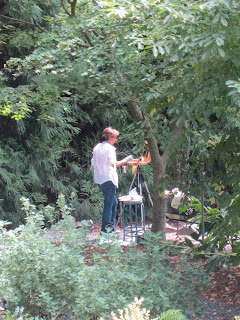 Yesterday I taught a plein air workshop at Smith Gilbet Gardens in Kennesaw, GA. We had a beautiful day-it started in the mid 60's and got up to 80 degrees but not as humid as it had been last month. 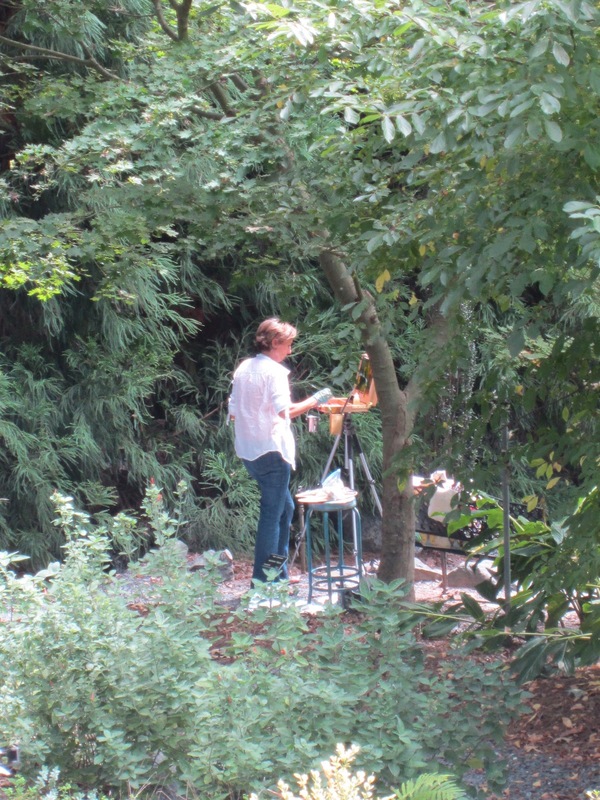 It was the first time painting outdoors for one of the students and the others were relatively new to it too. It's fun to open the door to a new experience for someone and hopefully one they will return to to enjoy again and again. 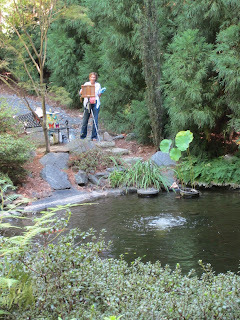 Below is the reference for the demo (obviously I took some artistic license) and some photo's of students painting on location by the koi pond and rose garden. Been concentrating a lot lately on capturing light and shadow and also experimenting more in the direction of impressionistic color. Took some photo's of flowers where I forced the difference in the lighting to practice. Below is the reference photo which I took some liberties with. I think I need to add a little more warmth into the deep shadows of the rose in shadow. Well, back to the drawing board. More to come. Now, I'm looking forward to my 10th trip back to Italy to teach another workshop one month from now. One of the wonderful things about art is that it can conjure up memories of a special time or place for both the artist and the viewers. The workshops really create an opportunity for many rich memories of new places, people and experiences and that is part of what I love about leading them. Yesterday was another day of making memories. I teach a one day workshop called "Art for Non- Artists" which is designed for absolute beginners. We do basic techniques and then a "paint along " so students see how to apply the techniques they just learned to a painting start to finish. Below is a photo at the end of the day with 2 of my students - a father and daughter, Peter and Marilyn, with their paintings. I hope it will be a cherished memory for them of a day of fun and learning shared together. Peter and his daughter Marilyn with their paintings. I've been away visiting my mom in NJ and doing some other travel recently. I haven't painted for over a week and have been going thru withdrawal. ( Yes, painting can be addictive). Yesterday, when I got back home I was anxious to get back in the saddle. It was kind of late to set up a whole still life, so I did this 8 x 10 oil painting from a photo I had of roses in the garden to at least get my brushes wet again. Was shooting to have it be simple and fresh, capturing the light and impression of the garden setting. Today, I'm off to buy some fresh flowers to get back to some still life set ups with some of the new "props" I picked up during my travels this summer. It's good to be home. Sign up for my Email Newsletter, "Bringing Beauty to the World"
Would you like a copy of Pat's new book? I'm a professional artist who paints in both oils and watercolor. 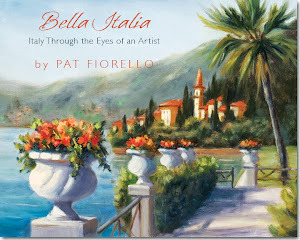 I teach painting in the U.S. and Europe and am author of the book, "Bella Italia, Italy through the Eyes of an Artist". 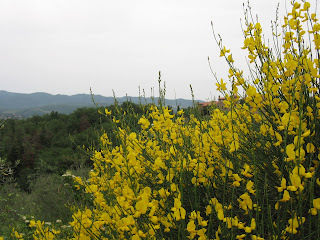 I thoroughly believe art can enrich your life and spreading that idea to inspire others to be engaged with art, whether creating or appreciating, is the purpose of my blog. Pat Fiorello 2011. Simple theme. Powered by Blogger.